Batgirl is everything! You cannot go wrong with any titles about her. She’s Batgirl, and she is wonderful! Batgirl wants to be like her dad—saving people. Barbara Gordon wants to be part of the action. She wants to be in the forefront, and not behind the scenes anymore. She wants to save the world like her dad does every day as the Commissioner. With her wit and logic, she convinces her stubborn dad to let her go to Super Hero High, but not without a set of rules that Batgirl has to follow. She’s gonna save people! She’s gonna make her dad proud (even if he had initially disapproved)! It’s all Batgirl ever wants to do. It heavily features a parent, Commissioner Gordon, unlike the previous Super Hero High books. In the previous Super Hero High books, the parents of the superheroes did not have a heavy presence in the book, but in Batgirl’s book, Commissioner Gordon does. While Wonder Woman and Supergirl’s parents/guardians were supportive of them to go to Super Hero High, Commissioner Gordon isn’t. He isn’t supportive, not because he thinks his daughter cannot handle it; he’s worried for her. She’s everything to him, and he doesn’t want her to get hurt. Most kids will have parents that are like Commissioner Gordon. Everybody gets stressed out, and Batgirl is no different. As a new student at Super Hero High, she has to juggle being a student, a tech wiz, and a contestant on a reality show about technologically savvy people. She tries to keep up the best she can, but she gets overwhelmed by her workload and the expectation to do well. She can’t do it all without having help. 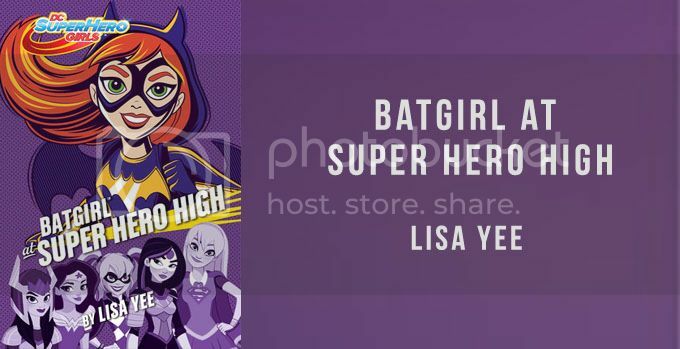 Should you read Batgirl at Super Hero High? Yes! Batgirl is the best! Like all the Super Hero High books, readers will be able to relate to everything that Batgirl has to deal with—especially a reluctant father who worries a lot, stress of juggling different workloads, and many more awesomeness. It’s things that all types of people—young and old—will deal with; it’s wonderful! « 2017 LOVE-A-THON • Sign-up time! I really liked this book, too. I’ve been reading this series with my girls and they’re completely hooked. Batgirl was my favorite book in the series so far. I loved her smarts and her can-do attitude!